Order your Aston Leather Zippered 10 Pen Case today from FahrneysPens.com. Fine Pens, Refills & Luxurious Gifts – great prices & fast shipping. Your growing pen collection deserves the best when it comes to storage and protection – we recommend the handmade quality of Aston pen cases. Crafted in select leathers from the best American tanneries and made in the USA, the cases are scratch-resistant, sturdy and guaranteed to last a lifetime. 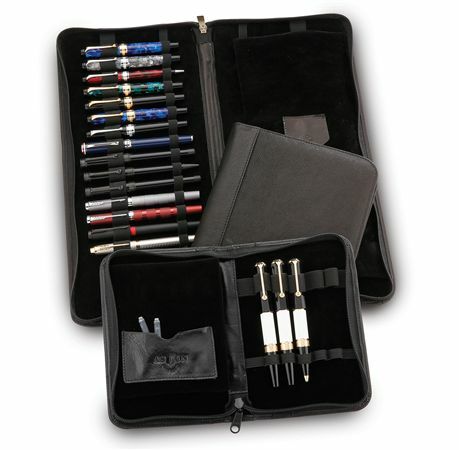 The zippered cases are lined in velvet with elastic slots to secure 10, 20 or 40 pens. Center flap prevents scratches and has a pocket to hold accessories. Lifetime warranty. In black only. Measures 8" high x 5 1/2 wide"